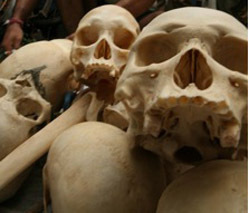 Skulls sitting in an evidence locker in India, stolen from grave sites by skeleton traders who deal with American anatomical supply companies. The more than 100 skulls in this seizure would bring in over $50,000. The global market for human bodies and body parts is far larger than we like to admit. We sell enormous volumes of blood, thousands of human skeletons, surrogate wombs, kidneys, and children for adoption in both legal and illegal markets. The root of the problem is bound up in our long held conflicted views about the worth of a human body. On one hand we believe that a human body should not be quantified and valued by the market. We believe that the only ethical way to exchange human materials is if it is done without pay and out of a spirit of altruism. Unfortunately in most of these markets the global supply of altruism is less than the global demand for human flesh. The difference is either paid in long waiting lists for legal tissue or by turning to criminal markets to make up the shortfall in supply. The markets for human bodies are disparate; in my book, The Red Market: On the Trail of the World’s Organ Brokers, Bone Thieves, Blood Farmers and Child Traffickers, I explored ten different illegal supply chains. In every case the efforts of law enforcement agencies were hamstrung by complex ethical and legal questions. On one hand we want to have access to bodies and body parts just in case we need a blood transfusion or kidney for ourselves; on the other we don’t want to live in a world that needs to turn to crime to increase the overall supply. Except in the most extreme examples, very few law enforcement agencies actually want to pursue cases on the Red Market. Here are some questions that journalists should think about when pursuing these stories. 1) Most bodies and body parts are procured altruistically without payment to the donor in order to eliminate exploitative commercial schemes, but why does that same ethic of altruism not apply to the doctors and middlemen who charge high rates for their services? 2) Since criminal elements often use standard privacy practices common in the medical profession to cover their tracks with illegal trafficking in organs, children, and human tissue, has the time come to re-evaluate the utility of privacy laws? 3) Is it possible to open all records pertaining to the movements of human materials and not sacrifice the quality of the services? 4) Despite increases in the supply of organs every year the length of the wait list for organ transplants has only grown since its inception in 1985. Given that every year it seems we require vaster quantities of human materials, is it conceivable that the real demand is much higher than we can estimate with waiting lists? Or does the demand for organs grow in relation to their supply? 5) If a child is kidnapped from his parents in the third world, sold to a middleman and then adopted in the first world, does any agency have the mandate to send the child back to his birth parents? 6) How do changes in the tissue supply policies of the United States affect policies in other countries? If a transparent and commercial system of tissue exchange started here, would that increase or decrease illegal red markets around the world? 7) Who is ultimately responsible for ensuring that illegal markets in bodies and body parts do not flourish? 8) If an American flies to China to buy an organ from an executed prisoner (against U.S. law) and then comes back to America, has he or she committed a crime? Should U.S. doctors continue to treat such a patient? 9) Question for pharmaceutical companies: Since the best indicators for the global supply of illegal transplants could be tracked through the sales figures of immunosuppressant drugs why do they refuse to release the information publicly? 10) Reproductive tourism continues to grow every year. It is becoming increasingly common to outsource a pregnancy to a surrogate mother in Asia or buy an egg from an eastern European egg donor. What issues would we have to contend with as a society and as a planet if the procedure goes mainstream and instead of a few hundred surrogate pregnancies a year outsourced to India, there were tens of thousands? Half of the organs transplanted in the United States go to people who haven't agreed to donate their own organs when they die. As long as we let non-donors jump to the front of the waiting list when they need transplants we'll always have an organ shortage. There is a simple way to put a big dent in the organ shortage -- allocate donated organs first to people who have agreed to donate their own organs. Anyone who wants to donate their organs to others who have agreed to donate theirs can join LifeSharers, a non-profit network of organ donors who agree to offer their organs first to other organ donors when they die. Membership is free at www.lifesharers.org ...or by calling 1-888-ORGAN88.